You are here: Home / Chapter 7 Bankruptcy / Parking Tickets Incurred After Filing Chapter 13: What Can Be Done? Parking Tickets Incurred After Filing Chapter 13: What Can Be Done? A Chapter 13 debtor filed for bankruptcy on September 11, 2014. Within the Chapter 13 case, he planned on repaying approximately $4,700 worth of parking tickets owed to the city of Chicago. The proposed plan was going to pay back approximately 10% to 20% of those parking tickets over a 3 to 5 year term. Everything was going smoothly for the debtor until the time that he received a notice from the city of Chicago. It appears that subsequent to the filing date of September 11, 2014, the debtor, or somebody driving the debtor’s vehicle, incurred parking tickets owed to the city of Chicago. The total outstanding debt, which was all incurred after the original filing date, totaled approximately $1,000. When the debtor failed to pay the outstanding, post-petition parking tickets in a timely manner, the amount of the outstanding debt doubled. Thus, the debtor now owed approximately $2,000 worth of parking tickets to the city of Chicago post-petition. The debtor called to try and determine exactly when he filed his Chapter 13. He was also advised that any outstanding parking tickets that were incurred after the filing date were going to have to be paid back separately, outside of the Chapter 13 plan. The debtor contacted the city of Chicago to make a payment plan arrangement and was told that he must pay at least $150 per month. The debtor simply does not have $150 per month available, above and beyond what he is currently paying to his Chapter 13 trustee. He contacted me for advice to determine what, if anything, he can do with regard to this debt. After all, he doesn’t want to have his vehicle booted, towed and impounded by the city. He also cannot afford $150 per month to avoid that possibility. Thus, we have a dilemma that I have seen way too often in my legal career. 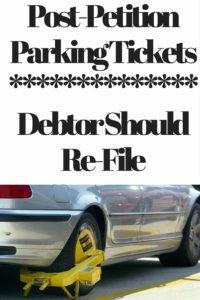 The best option or remedy for a debtor who cannot afford to pay post-petition parking tickets is to dismiss the current Chapter 13 bankruptcy case and re-file. Yes, re-filing does come with some drawbacks. First, the debtor will have to pony up another filing fee. Second, the debtor will have to take credit counseling again. Third, the debtor will have to provide the most recent four years of federal tax returns. Lastly, the debtor will have to provide the most recent two months’ worth of pay advices. As the debtor’s counsel, with his authority, I have the ability to bring a motion to dismiss his current case. Provided there has not been a motion to modify the automatic stay brought by a creditor, we have the ability to re-file the case immediately after it is dismissed. This will protect the debtor immensely. The post-petition parking ticket debt that he did not have the ability to repay and which could not be put into his prior chapter 13 because it was post-filing, can now be all put into his new case. The city of Chicago will have an opportunity to file a proof of claim and be paid out in accordance with the Chapter 13 plan. My office will notify the city of Chicago as well as their attorneys, Arnold Scott Harris, immediately upon the filing of the second case. We will also call the hotline at Arnold Scott Harris to notify them of the new case number and filing date. This is a good option for the debtor who simply cannot afford to have his vehicle booted, towed and impounded. In conclusion, there are only two ways to deal with post-petition parking ticket debt. The debtor can work a payment plan with the city of Chicago. In the current example, he cannot afford the $150 per month. He simply did not have the funds available from any source whatsoever. The other option is to dismiss the current Chapter 13 and re-file. By re-filing, all of the outstanding parking tickets incurred prior to the date of filing a new case can be included in the plan. This will prevent the city from booting, towing and impounding his vehicle. He will then have the ability to get to work and begin to make payments on a reorganization plan. After giving both options to the debtor this evening, the debtor is going to consider re-filing. It truly is the best option under these particular facts.